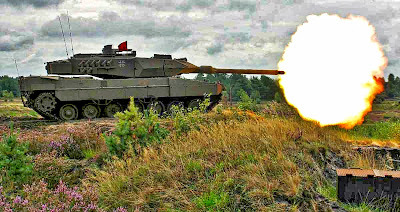 BERLIN, Germany -- Germany’s parliament just submitted a budget request to develop a new tank. Germany has upgraded the Leopard 2 design over many years. The Leopard 3 design will be a new tank altogether. Nestled inside the budget committee report is the call for a Leopard III development program, to create a new “Kampfpanzer” or battle tank. Spotted at Defence Blog, the proposal to develop a new tank program as part of medium-term military planning is a sign that all’s not quiet in Europe. It is impossible to see German tank developments without hearing the echoes of history. While Great Britain invented the tank, between the World Wars Germany was the first country to really seize on the revolutionary potential that the armor offered a military. Germany’s rapid advances in the early days of World War II were spearheaded by aggressive tanks, and it took the Allies years to drive them back from positions they conquered in months. But at the Battle of Kursk in 1943, Germany found their more advanced tanks ground down by Soviet defenses and defeated by a Russian armored counter-attack. The CIA also estimated that tanks deployed by Russia and its Soviet allies in Central Europe outnumbered NATO tanks by almost 3-to-1. Fortunately, the modern world is much different than that of 1945 through 1989, thanks to the fall of Soviet Russia and the reunification of a Germany that had been divided into two opposing halves expected to annihilate each other in a new World War. The end of the Cold War didn’t necessarily mean the end of war between big countries, and Russia’s invasion of neighboring Ukraine undermines the notion that a quiet Europe is forever free from war. And modern warfare means tanks. Germany recently bolstered their current arsenal of tanks by buying and upgrading 20 Leopard 2A7 tanks acquired from the Netherlands, though originally from Canada. Upgrading old tanks is fairly routine and accounts for the dangers of the present. Developing a new advanced tank, instead, is a bet on the future. In August, German company Krauss-Maffei Wegmann (KMW), makers of the current versions of the Leopard tank, merged with French defense company Nexter. Speaking to the merger, KMW CEO mentioned the idea of a Leopard 3 tank, noting that France has a strategic perspective that stretches decades into the future. In October, when the budget committee of Germany’s parliament put together their draft of a 2015 spending bill, the proposal to develop a new tank was quietly noted, and then debated in an independent German armed forces journal. There are few details at present about what, exactly, the Leopard 3 program will entail, and what improvements it will have over previous generations of tank design. As Russia’s currency crumbles and the war in Ukraine drags on inconclusively, the urgency behind the new request for a tank may fade. But it’s hard to predict future conflicts from decades away. By developing a new tank, Germany gives itself a tool to help face them. If Merkel and the German government continue their two-faced, entirely self-serving policy towards Ukraine and Russia, then they may have a use for that tank sooner than they expect. For a country that had devastated so much of Ukraine in WWII, Germany has shown little remorse, and has had no qualms about rebuilding Russia and helping it to continue devastation of Ukraine. As far as I am concerned...perhaps they will have hoisted themselves on their own petard.